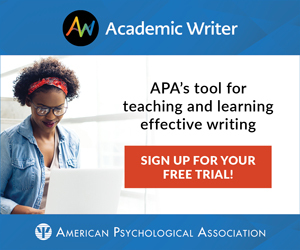 Teaching Current Directions in Psychological Science offers advice and guidance about teaching a particular area of research or topic covered in this peer-reviewed APS bimonthly journal, which features reviews covering all of scientific psychology and its applications. Basu, S. & Savani, K. (2019). Choosing among options presented sequentially versus simultaneously. Current Directions in Psychological Science, 28(1), 97–101. Someday your students may sit in a human resources (HR) office choosing a health insurance plan. Such plans vary on copays, deductibles, mental health care coverage, prescription drug prices, maternity benefits, and more. It’s a complex choice that people don’t always get right. Should HR officers show each plan’s website one at a time? Or create a table in which employees can consider the plans simultaneously? The way decisions are presented (for example, sequentially or simultaneously) is called “choice architecture” (Johnson et al., 2012). But which choice architecture helps employees to pick the best health care plan for them? According to Shankha Basu and Krishna Savani (2019), we make better choices when we consider our options simultaneously. When choices are structured simultaneously (for example, viewing four cell phones), we process their features more in-depth, compared to sequential presentations (“here’s the first phone….”). When viewing sequentially (such as when we browse products on a website), we may also compare each option to an ideal “dream” choice. We’re dissatisfied with our choice later on, because none of the options lived up to that hoped-for standard. In contrast, when we view simultaneously, we compare options to each other — not to our imagined ideal — and we end up happier (Molinger, Shiv, & Iyengar, 2013). Students are likely to love the variety of applications that follow from choice architecture research. Open a lesson on this topic with a vivid example from online retailer Zappos.com. 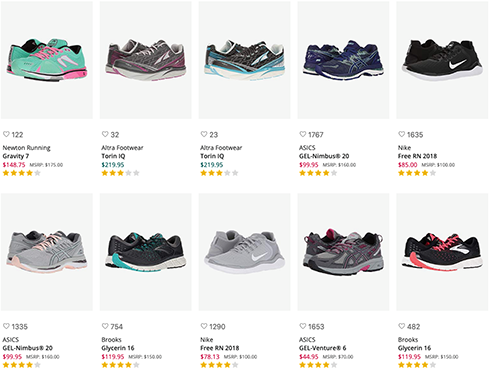 Show a screenshot of pairs of running shoes (as in Figure 1) and ask students to contrast this presentation with viewing only one pair of shoes at a time. Which choice architecture would lead to the best decision? Next, try this demonstration based on Basu and Savani’s own research (2017). Randomly assign students to two groups. One sees options simultaneously, and the other sequentially. You can prepare index-card-based handouts or use an online system. (I made Google Form versions of simultaneous and sequential forms.) Remember that when presenting options sequentially, you should allow students to go back to previously presented options. Problem 2: You’re in the market for a new laptop. You want one with the best combination of features. Which laptop should you buy (Table 2)? Each scenario has an objectively “best” choice (i.e., cloves supplier E and laptop model D). Did your students select the correct one? Did accuracy depend on choice architecture? These real-world scenarios introduce further applications and strategies. After modeling the first two together, assign students to discuss the rest in small groups. Scenario 1: You are a hiring manager interviewing candidates for a sales position. Obviously you can only interview one job candidate at a time. Each interview takes about an hour and you’ve scheduled four candidates over the course of 1 day. How might you change the choice architecture in this case to make it more likely your company will select the best candidate? Answer: You need to turn this sequential task into a simultaneous one. After the interviews are over, make a table summarizing data on all of the candidates. Or, place all resumes on the table and consider them all together. Scenario 2: A friend is giving up his off-campus apartment. It’s close to campus, has free parking, and the rent is in your price range. Internet access and utilities are extra, but the apartment is gorgeous. The landlord is willing to give you first dibs on the place; should you take him up on it? Answer: You might be happy in your friend’s apartment, but why not be sure you’re making the best choice possible? Ask yourself, what are all of the apartments we could consider? Scenario 3: You’re scrolling on Instagram when you see an amazing vacation deal: The Bahamas for only $1,200 per person, all-inclusive! The photos of the resort look beautiful, and you’d love to get away with your sweetheart. You’re tempted to purchase the deal right away. What should you do? Scenario 4: Imagine you’re a judge on the TV program The Voice, where each performer sings a different style of music, showing their own unique stylistic choices. How can you pick the best singer fairly? Scenario 5: Imagine your company has a special opportunity to expand into a special market in Eastern Europe. Should your company make the investment, or not? Scenario 6: You’re shopping for a new dining set with your partner. You’ll visit three furniture stores before making your decision. How can you make the best choice? Basu, S., & Savani, K. (2017). Choosing one at a time? Presenting options simultaneously helps people make more optimal decisions than presenting options sequentially. Organizational Behavior and Human Decision Processes, 139, 76-91. Johnson, E. J., Shu, S. B., Dellaert, B. G. C., Fox, C., Goldstein, D. G., Häubl, G., …Weber, E. U. (2012). Beyond nudges: Tools of a choice architecture. Marketing Letters, 23, 487-504. Mogilner, C., Shiv, B., & Iyengar, S. S. (2013). Eternal quest for the best: Sequential (vs. simultaneous) option presentation undermines choice commitment. Journal of Consumer Research, 39, 1300-1312. Fernandes, M. A., Wammes, J. D., & Meade, M. E. (2018). The surprisingly powerful influence of drawing on memory. Current Directions in Psychological Science, 27(5), 302–308. Leonardo da Vinci, Isaac Newton, and other great thinkers often represented their ideas visually. Rather than scribbling in sketchbooks, today’s students typically paraphrase or verbally summarize the concepts they learn. Does drawing concepts produce advantages relative to conventional notetaking? Myra Fernandes, Jeffrey Wammes, and Melissa Meade (2018) make a compelling case that drawing powerfully affects memory. To orient students to this effect and the general procedure for studying it, try the following demonstration. Present the 20 words below one at a time for 6 seconds each, with half the items in black font and the other half in red font. Ask half of the class to draw an image of the object that the word represents for words appearing in black font and to write the word as many times as they can for words appearing in red font. Reverse this instruction for the other half of the class. After the last item, ask students to turn over their notes and have them count backwards from the number 694 for 30 seconds. Then give them 2 minutes to recall as many words as they can. You should find that students recall more of the drawn items, despite equal processing time for both sets of items. Indeed, in a study using similar conditions (except that the list consisted of 60 words), participants recalled about five times more drawn items (Wammes, Meade, & Fernandes, 2016). In discussing their impressions of this drawing effect, critical students may mention that the control task (copying the word) is relatively weak in the sense that it encourages little meaningful processing. The effect, however, turns out to be robust. Drawing produces better memory than other effective encoding strategies such as semantic elaboration (listing semantic features of words) and forming images. Also, the benefits of drawing occur with short and longer lists, fast (4 second) and slower (40 second) presentation rates, and with unmixed as well as mixed lists (Wammes et al., 2016). Moreover, drawing improves memory even for individuals who score low in imagery ability and who have little artistic background or ability (Fernandes et al., 2018). At this point, you could encourage students to think about why drawing has potent effects on memory. Fernandes et al. (2018) believe that drawing leads to a richer and integrated memory trace that includes meaningful elaboration (drawing requires you to think about the features of the object), motoric information (the movements made to create the drawing), and pictorial information. In support of this explanation, Wammes, Jonker, and Fernandes (2018) report results showing that drawing, which includes all three of these components, produces better memory than encoding tasks that include only two of the components (such as tracing a picture of an item, which includes only the motoric and pictorial components). Remind students that another goal of psychological science is application. Encourage them to think about the potential benefits of drawing in real-world settings. One possibility is that drawing might be a useful technique for improving remembering in populations that show memory decline. Along these lines, Meade, Wammes, and Fernandes (2018) have shown that drawing reduces typical age-related memory deficits. Fernandes et al. (2018) also report unpublished data indicating that dementia patients show memory benefits from drawing. Perhaps you could help people with severe memory problems remember their daily tasks (e.g., sweeping the room) by drawing pictures of themselves performing those tasks. Another potential application is in educational settings. When taking notes, students might think about drawing the concepts they learn rather than describing them verbally. In support of this view, Wammes, Meade, and Fernandes (2017) found that drawing out the definition of academic terms (e.g., lymphocyte) produced better memory for the definitions relative to verbatim (but not paraphrased) notetaking. The research on drawing with more complex educational materials (e.g., texts), however, is mixed. Some studies have found that drawing enhances memory relative to traditional notetaking whereas others have not (see Van Meter & Garner, 2005, for a review). Understanding the conditions under which drawing improves memory with educationally relevant materials and outcomes is a promising and important direction for future research. You could challenge students to generate moderator variables that may influence the extent to which drawing improves memory. It may be, for example, that drawing is an effective encoding strategy with certain types of materials (e.g., concrete concepts) but not others. With more complex learning materials and longer retention intervals, perhaps drawing ability (i.e., the ability to represent the concepts accurately) is relevant. Hacker, D. J., Dunlosky, J., & Graesser, A. C. (2009). Handbook of metacognition in education. (D. J. Hacker, J. Dunlosky, & A. C. Graesser, Eds.). New York, NY: Routledge/Taylor & Francis Group. Van Meter, P., & Garner, J. (2005). The promise and practice of learner-generated drawing: Literature review and synthesis. Educational Psychology Review, 17(4), 285–325. Wammes, J. D., Meade, M. E., & Fernandes, M. A. (2016). The drawing effect: Evidence for reliable and robust memory benefits in free recall. The Quarterly Journal of Experimental Psychology, 69(9), 1752–1776. Wammes, J. D., Meade, M. E., & Fernandes, M. A. (2017). Learning terms and definitions: Drawing and the role of elaborative encoding. Acta Psychologica, 179, 104–113. APS Fellow Beth Morling is professor of psychological and brain sciences at the University of Delaware. She attended Carleton College and received her PhD from the University of Massachusetts at Amherst. She regularly teaches methods, cultural psychology, a seminar on the self-concept, and a graduate course in the teaching of psychology. APS Fellow Cindi May is a professor of psychology at the College of Charleston. Her research explores ways to enhance memory and cognitive functioning for older adults and individuals with intellectual disabilities. May can be contacted at mayc@cofc.edu.